Stylish and elegant are words that spring to mind when one sees Rotherwood House in Measham Road, Ashby de-la Zouch, Leicestershire. Believed to date from the early 19th century, this aesthetically appealing Georgian property has white rendered elevations beneath a hipped slate roof. 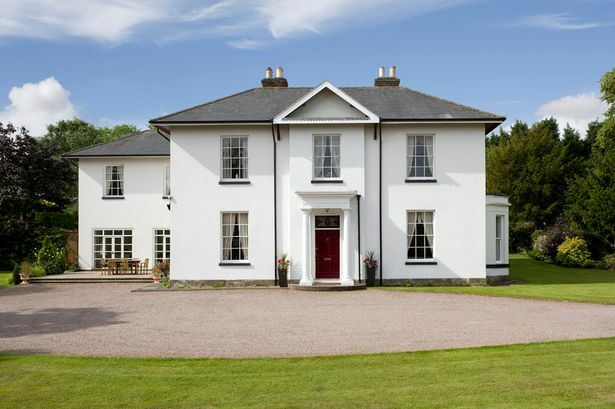 Its distinctive large sash windows flood the house with natural light while inside there are high ceilings and grandly proportioned rooms, some formal, others ideally suited for family use. There is fine carpentry work throughout, delightfully detailed door cases and a number of beautiful fireplaces. The gravel drive leads to an impressive Doric porch over a fine front door surmounted by a striking stained glass fan light. It leads to a generously proportioned entrance hall with a superb Hopton Wood stone floor. This hallway runs the full length of the house with an elegant staircase rising to the first floor. The principal reception rooms are positioned to the north east facing front of the property and the drawing room has a fine bay window providing lovely views of the gardens. Also on the ground floor there is a study that has been fitted out by Osbournes of Ilkeston, recently refitted shower room, and a large games room/family sitting room with two sets of French doors leading to a terrace area overlooking the garden and surrounding countryside. The hallway continues on to an impressive bespoke kitchen/breakfast room that has been fitted out by Tutbury Interiors with beech units and a large central island surmounted by a Corian work surface. There is also a four oven, gas-fired Aga with electric hob which is positioned in an original alcove. A lovely 16-pane sash window provides an outlook over the garden. Connected to the kitchen by an archway is a spacious breakfast room with a fireplace and woodburner, exposed ceiling timbers and French doors which lead to a lovely courtyard. Off the kitchen/breakfast room is a utility area which is well fitted with storage units, Corian work surfaces and sink. Amtico flooring runs through the kitchen, breakfast room and utility room. Stairs rise from the breakfast room to two bedrooms and a shower room on the first floor which could provide semi-independent accommodation – ideal for a dependant relative, nanny or teenager. The cellar has two vaulted chambers with brick thrawls. This currently acts as a useful workshop and storage area. Up on the first floor the accommodation provides great flexibility, offering ample space for family and for guests in the generously sized rooms. There is a wide main landing with archway and stained glass light, and doors leading to five bedrooms with fitted wardrobes. Two of these have en suite bath/shower rooms while the other rooms are served by family bathrooms, one with Jacuzzi and another with steam shower. The master bedroom is particularly spacious and has a large en suite shower room with twin basins, walk-in shower, toilet, bidet and Travertine tiling. Outside, Rotherwood House is set well back off Measham Road and is accessed via a Tarmac drive. This leads to an automated entrance gate and onto a sweeping gravel drive with a wide parking area at the front of the house. The gardens are beautifully maintained with expansive areas of lawn studded and bounded by mature trees including beech, copper beech, ash and lime. Beds are stocked with established shrubbery providing colour throughout the year. The boundaries of the property include a lovely high period brick wall and beech hedging. In a sheltered area of the garden and close to the house is an outdoor pool. A timber pool house makes a suitable area for changing. The property has a good-sized double garage. Rotherwood House is very well positioned on the edge of the market town of Ashby de-la Zouch with views over countryside to the town and Ashby castle in the background. It occupies a semi-rural position and yet has easy access to the town and the A42/M42. The location is ideal for access to regional centres and major lines of communication including the A42/M42, A50 and M1. Birmingham is less than 30 miles away. Derby, Leicester and Nottingham are all within striking distance. The mainline railway stations at East Midlands Parkway and Tamworth provide excellent services to London. The house will also appeal to keen golfers as it is just 300 metres from Willesley Park Golf Club.